Pictured: Beverly Wright, Stewart Wright and Joel Prendes receiving the award. 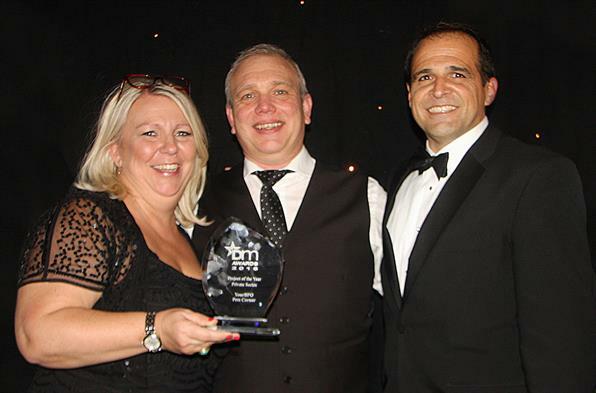 We are thrilled to announce that YourBPO has won the award for Best Project in the Private Sector at the Document Manager Awards, for their Outsourced Invoice Processing project for Pets Corner. Pets Corner had been using Invoice Processing and Document Management solutions, provided by YourDMS since 2009. However, with significant growth expected, Pets Corner looked to YourBPO to discover new options for handling growth within their current Accounts Department. YourBPO designed and developed an integrated, cross-platform solution that outsources the capture, validation and verification of purchase invoices, eliminating 99% of manual data entry. Before the introduction of the new solution, Pets Corner’s Accounts Payable team were processing around 2,000 stock invoices per month. They now process around 5,000 invoices per month. The Document Manager Awards recognise the UK Document Management industry’s most outstanding products, suppliers and projects. Winners are chosen by a panel of expert judges and were announced at the awards ceremony at the Grand Connaught Rooms, London on 24 November 2016. Congratulations to everyone at YourBPO – the award is a well deserved reward for your hard work. We can’t wait to see what innovative projects you’ll be working on next!